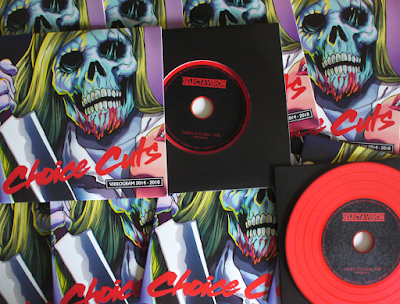 I'm excited to announce that the Choice Cuts 2014 - 2018 CDs have arrived at the Videogram/SelectaVision HQ and they both look and sound great! The second installment in the Videogram redux series, the CD culls album, EP, and single tracks from Videogram's 20+ discography, as well as previously unreleased material such as my collaboration with Acid Washed's Andrew Claristidge and the scrapped Slasher EP - all remixed and remastered specifically for this album! Fourteen tracks in total, this limited-edition red vinyl-effect CD comes in an oversized full-color outer sleeve with a printed record-style full color inner sleeve. Available via my merch page on Bandcamp. More details (and photos) here.